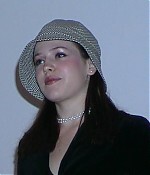 I added some really old pics from 2001 (I think) from the ‘OTO Weekend Party’. The pics were taken by Kent aka Covina Guy and Majandra looks so adorable in them. I’m sure some of you have never seen them before. Enjoy! Marica, I don’t think I’ve seen those pics before either. Very nice! Thank you to Kent for sharing. I figured that a lot of people haven’t seen them before and they are just adorable.